COLUMBIA, S.C. (AP) — Every player on South Carolina’s team knows the reason the Gamecocks went 4-4 in the Southeastern Conference and are still trying to become bowl eligible in mid-November — they have struggled to maintain momentum for an entire game. The latest example was last week’s loss to Florida, in which the Gamecocks blew a 17-point lead in the final 16 minutes. There were slow starts against Kentucky, going down 24-3 after the Wildcats first four drivers and versus Texas A&M, trailing 16-0 at half, that created problems an excellent second half couldn’t solve. The inconsistency leaves a team thought to be the most likely challenger to Georgia in the SEC East locked into fourth in the division with three games to go — all against nonconference teams. The Gamecocks play Football Championship Subdivision Chattanooga on Saturday, perhaps the best shot at getting that sixth win to go to a bowl with No. 2 Clemson looming at the end of the month and a Dec. 1 game with Akron to make up for a game canceled because of Hurricane Florence. “If we go back and look at it, there are five or six plays where a better block here, or a throw or catch or whatever it may be — a little thing could have been the difference in the game,” quarterback Jake Bentley said. Chattanooga provides a relief from the grind of eight straight SEC games, only broken up by a bye week and an unexpected week off after the Sept. 15 game against Marshall was canceled by Hurricane Florence. South Carolina has only lost twice to FCS teams since 1990 — both times to The Citadel. Even with the 23-22 loss to the Bulldogs in 2015, the Gamecocks have averaged a 21-point win over their last dozen FCS opponents. The Mocs will have their own motivation. At 6-4 and with their Southern Conference season over, they are likely on the outside of the 24-team FCS playoff bracket. But a win over South Carolina would be impossible for the playoff committee to ignore. And without a lot of pressure to win, Chattanooga defensive lineman Isaiah Mack said they can have fun. “It’s going to be a fun game. Just pin your ears back and let’s go play some ball. Try to get an upset really,” Mack said. For South Carolina, a stunning loss to Chattanooga would turn an uneasy year closer to a disaster. After Will Muschamp took the 3-9 team he inherited to six wins in 2016 and nine victories in 2017, this season the Gamecocks rise seems to have stalled, barring a stunning win to break Clemson’s four-game winning streak in the is-state rivalry. But Muschamp said he thinks the inconsistency is temporary. Players usually listen better after a loss and he saw a lot of improvement at Tuesday’s morning practice. 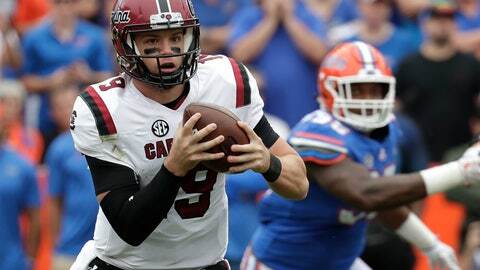 The Florida game was unusual for Muschamp’s three years at South Carolina. It was only his sixth loss in 23 games decided by seven points or fewer. Bentley said the key for South Carolina this week is to quickly learn from the Florida mistakes, and not dwell on them, and ignore the huge in-state rivalry game at the end of the month. “Not only can we not look ahead, we can’t look behind,” Bentley said.